Getting Ready for Release! 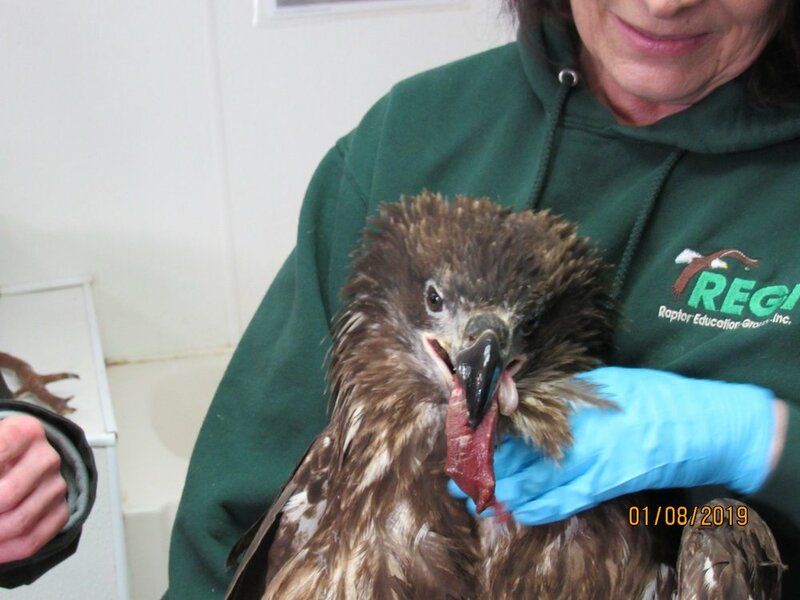 — Raptor Education Group, Inc. The week before a release is always super busy for us. 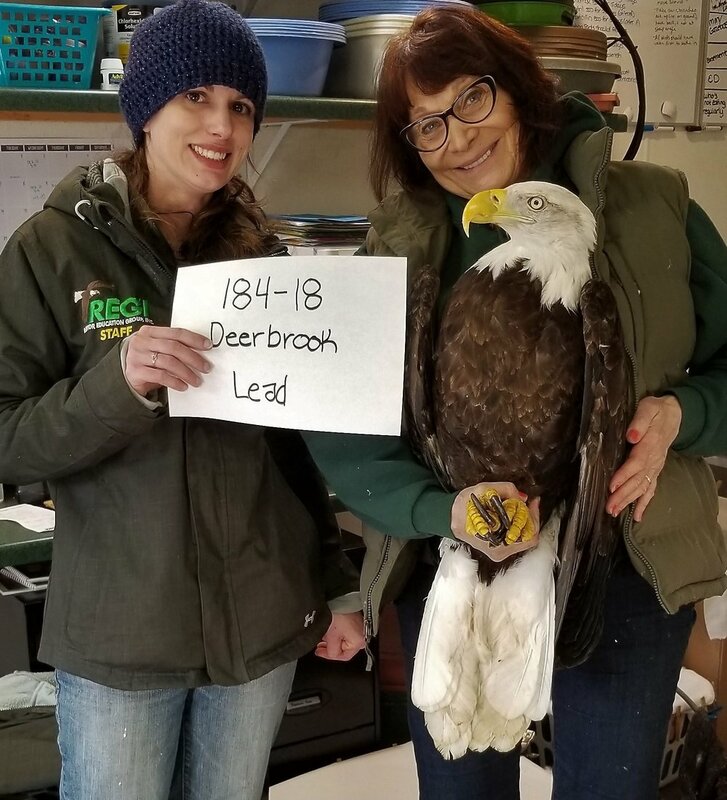 This is the time when we are not only caring for our regular patients but also doing the final flight evaluations with the eagles that will be released. Once we check out their flight, ability to maneuver and stamina, we catch up the eagles from our massive conditioning flight. In the clinic the birds are blood tested one last time to assure any lead poisoning has not crept back into their blood stream. The eagles are all evaluated for healthy feet which are vital to them as that is what they use to hunt and eat with as well as perching. They are treated to a final pedicure including condition of the feet with bag balm to assure they have their natural oils back and have no injury or sores from captivity. Their feather condition is a very important issue not only because they live and survive in a cold environment, but a bird’s flight feathers is the same as an aircraft’s wings and tail. Missing parts of the tail or wing feathers will affect how they fly and even more importantly how skillfully they can maneuver during hunting or landing. When an eagle leaves our hands for life in the wild, we are responsible to make certain he or she is prepared to interact with other species as well as their own. He must know what natural food is and how to obtain it. It must behave perfectly and have keen social skills, or the bird may not be accepted by his own species. To not be accepted is a situation that can have fatal results. It may look simply... it seems just a matter of opening a box or carrier and then celebrating as the eagle takes to flight. 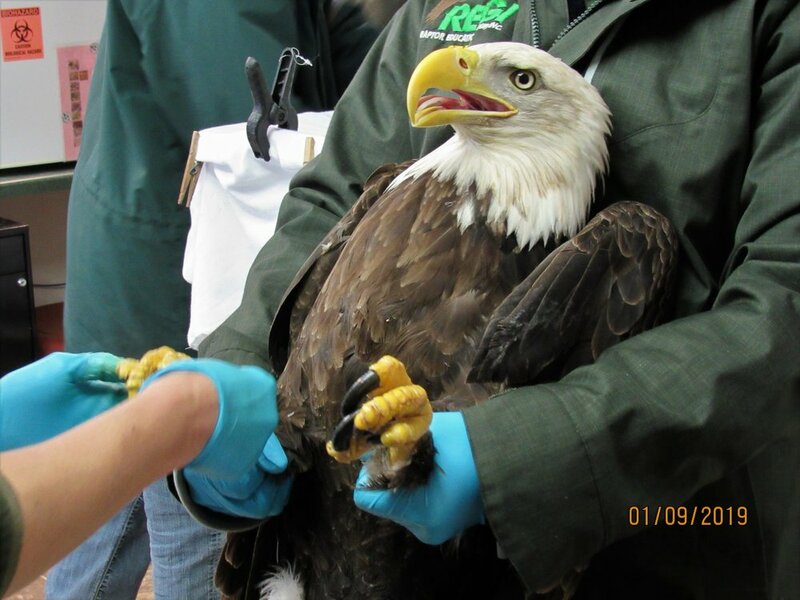 That is the visual, but reality is that final moment is the culmination of months of rehabilitation for the eagle and months of sometimes difficult treatment, care and feeding and finally conditioning the patient so they are 100% perfect in every aspect from their feather, body and flight condition to their mental acuity and appropriate behavior and ready to be in the wild once more. We are excited to release our soon to be former patients. They have endured so much and are now ready to have their life back. We are excited to share them and their success stories with you. Remember months and sometimes longer go into every single bird that leaves our care. We are often asked if we will miss them or if we are sad to see them go. The answer is, this is a time to celebrate their success and ours as well. 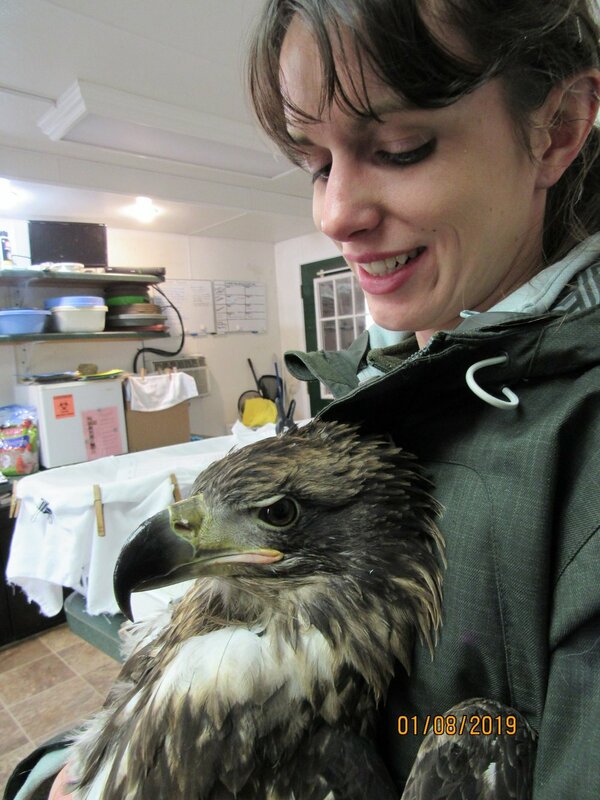 We hope you enjoy a few photos of the birds that will be released during their pre-release physicals. The release was at VFW Park on Saturday Jan 12, 2019 at 1.p.m. Update photos on Snowy Owl.